Welcome to Marvel Strike Force Heroes page. This is the full description of MSF Hawkeye stats, skills and abilities. Hawkeye is a S.H.I.E.L.D. controller who can blind his opponents. His first skill delivers heavy damage with increased critical chance and additional Piercing damage. His second skill strikes the primary target for the medium amount of damage and clears positive effects from primary and all adjacent targets. In addition Speed Bar of primary target is reduced by 10%. Hawkeye ultimate inflicts 140% of his base damage to all enemy targets and blinds them in the process. Passive ability grants him a chance to attack targets in Stealth at the start of each turn and clears Stealth from those targets. Hawkeye price is 45 shards which can be obtained via Mega Orbs, Premium Orbs, 6-6 Heroic Assemble campaign mission, and 1-9 Villains United campaign mission. Hero, Global, Skill, Controller, Avenger, S.H.I.E.L.D. 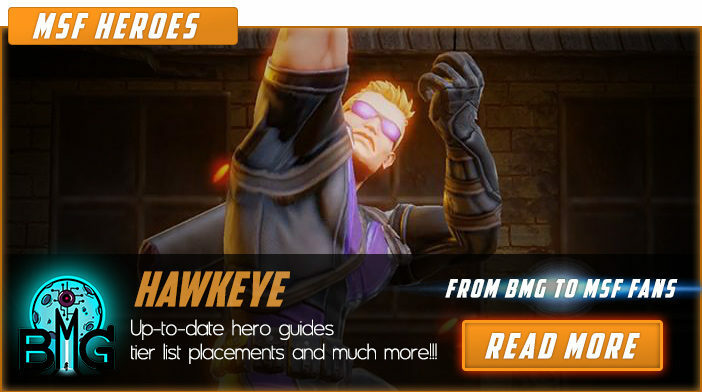 We hope that you enjoyed the description of MSF Hero Hawkeye. For detailed information about other MSF Characters check our MSF Heroes page.